Okay, so, another wrestling review! Shock I know, but this time, it’s on a promotion that I managed to see live for the first time, and that is of the Scottish based promotion, Insane Championship Wrestling, or better known as ICW, or I-C-Dub to those that chant the initials of this promotion in, mostly, admiration. I’d seen a few odd matches here and there, but never an actual full show. But after this review, I will definitely look into more shows, and after this review, maybe all of you will too. Granted, you need to be in your adult years since these shows are usually eighteen plus – as far as I’m aware – since there are lots, lots, lots of crude and vulgar chants about anything that is indecent to the concerning parent who cares for their child’s squeaky clean image. And as this show is for adults, it made sense that the venue was for adults as well, in this case it was at The Tramshed in Cardiff. While the drink I had was on the pricey side, as most bars are, I have to say I loved this place simply because it is one of the few places I’ve been to so far that sells Raspberry Kopparberg. Now, I’m trying not to sway underage drinking in anyway, but to those who have had this drink – oh how I have missed you! Seriously, this flavour of Kopparberg is a little more difficult to find compared to the others since they don’t sell them in shops and not many bars or pubs sell this flavour. Or maybe they do in other parts of Wales, or Cardiff, or anywhere. All I know is that Mixed Fruit tastes like medicine and I had an accident in the past with Strawberry & Lime ruining the taste of it for me. The others aren’t that special either but, Raspberry, if you had ears, I’d whisper sweet somethings into them all day every day. Uh, well, that got weird, but yeah the venue wasn’t bad at all, there was the main floor and the balcony areas where people could watch the show. I chose the balcony mainly because I saw a few people from training go up there, and also it was the only real way I could sit down since there sadly weren’t seats anywhere as everyone had to stand up. Makes sense since the few ICW shows I have seen have all had people standing. Plus some people were sitting down watching through the glass, not blocking the view of others which was a smart thing. Wish I thought of that during the first half of the show, though. But, yeah, a nice venue with a very nice ring set up. 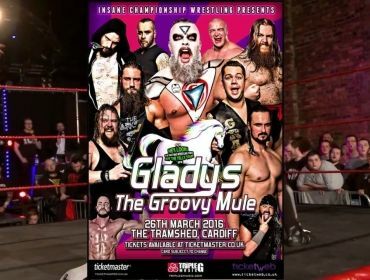 Looked like other ICW shows I have seen even at a different venue like The Tramshed. There was even a large tron on the side of the entrance to show the names of those entering as well as the camera views of the matches. Wish the sound was a bit better though. I mean the crowd was definitely loud throughout the night so it was difficult to hear people sometimes, plus I’m not too good at understanding thick Scottish accents. I can’t understand out I’m sorry, I mean I have a hard enough time mistaking a Scottish accent for an Irish accent as it is. And there goes my Scottish and Irish readers, if there ever were any. But, yeah, the music would be so loud that the whole place would vibrate so yeah, a little difficult for me to get used to. Well yeah, enough rambling, review time! Before the opening match began, one of the commentators who would be providing commentary for the show on the ICW on Demand version (which is why they had a camera view on the tron I assume) came out to greet everyone and made some funny jabs at current events going on in wrestling. There was fun poking at WrestleMania weekend coming up and Hulk Hogan’s billion dollar court scandal, among other things. They love a good bit of banter the Scottish do don’t they? They also told people not to be idiots by throwing anything into the ring. They’d get banned from the venue and future ICW shows, so what’s even the point? The cussing chants started here as I expected, and everyone picked their sides, mainly cheering for Kenny Williams, and Dickie Divers, while people were mixed on ‘The Filth’ Stevie Boy with mostly boos. This opening match was a nicely paced match that had a few nice moments placed in, such as a kicking sequence that was truly something. In the end, after Dickie hit Kenny with a Killswitch/Unprettier he was soon hit with a Flip Piledriver from Stevie Boy after he snuck in to get the pinfall victory. The crowd (for the most part) was not happy that Stevie won, and he didn’t much care, even to the point of spitting into the crowd. Not exactly the most gracious winner is he? I understand why he calls himself ‘The Filth’ now. The match of the first half, in my opinion, came from these two. Lionheart wasn’t much liked by the people of Cardiff, while everyone knew who ‘Iron Man’ Joe Coffey was as they sang along with his entrance theme! This will happen a lot throughout the night by the way, just a heads up if I sound like I’m repeating myself. This match had a little bit of everything. A small bit of tech to start, some outside brawling, with the larger Coffey even throwing Lionheart over the barricade and then diving over it onto him! And this trend of impressing everyone continued with Coffey as he had a few flying moments with a reverse crossbody and a front dropkick, both from the top rope. He also performed a deadlift German suplex which is always baffling to see for me, and a deadlift vertical suplex to Lionheart, who was on the apron, while Coffey was on the second rope. I can never understand how people can do stuff like that. Also, just the ways in which the two worked together just worked for me, even though I’ve mostly talked about Joe here. In the end though, Coffey got the pinfall win after a counter move from Lionheart into a Discus Clothesline. Mikey came out in his usual fish-net stocking, which always amuses me considering he looks like the most sadistic person with his painted up bearded head. He also had a wicked skull like mask, or helmet or something. At this point, I had trouble seeing the action as again, I didn’t think of sitting below people until later on. Anyway, before ICW’s ‘Local Hero’, Joe Hendry, even came out, a video of him masquerading as Whiplash appeared to Joe performing a spoof of Spice Girl’s Wannabe. This didn’t amuse Mikey as he darted towards the back and the next thing we knew, we see Whiplash at a different part of the ground floor with Hendry in hand and the video shut off. The rest of the match followed this pattern of lots of heavy hits and brawling between the two and it could have honestly gone either way. In the end Mikey pulls out a surprise victory after some type of altered small package pin on Hendry that honestly seemed much quicker than I thought it would be. This would be an interesting match as it had the NAK, who were more the favourites with the Cardiff crowd, facing off against Jack Jester, who I saw wrestle last month for a different promotion, and Drew Galloway, one of the more well-known names on the show, better known for his previous work with the WWE and currently with Total Nonstop Action/TNA. He even came out to the ring with his newly won TNA World Heavyweight Championship, which was shocking to see. This obviously brought out the loud TNA chants because everyone loves to hate on TNA, I suppose. The Black Label took a while showboating outside of the ring, so they ended getting a suicide dive as a result. Eventually the match started and it mostly had The Black Label members using shenanigans and dirty tactics to get the upper hand. At one point, Jester threw a steel chair at the head of one of the Kliq guys, and damn, that sight and sound was scary, sickening even. Even with this the NAK managed to have their moments, at one point having a chop off with Drew with constant gunshot like chops across the chests. In the end, The New Age Kliq won – somehow. I couldn’t quite see from my view being blocked at this point which is a shame, but what I saw was after this win was Drew hitting both Gunn and Renfrew with his TNA Championship belt, which of course got more chants. When things seemed bad though, ICW’s World Heavyweight Champion, Northern Ireland’s Big Damo ran down to try and fight them off, but sadly he got jumped by his challenger for later in the night, TNA Superstar Bram. During this continued beat down he got chants of ‘You hit women!’ and a few ‘We want Charlotte!’ from the more ‘smart’ fans who loved to find the bad points out online of the man’s personal life and bring them in as an insult. I would love to see them say that to the man’s face in a public place that isn’t at a show like this. I think they would think twice about talking about his supposed domestic issues then, and if not, then they are simply moronic. 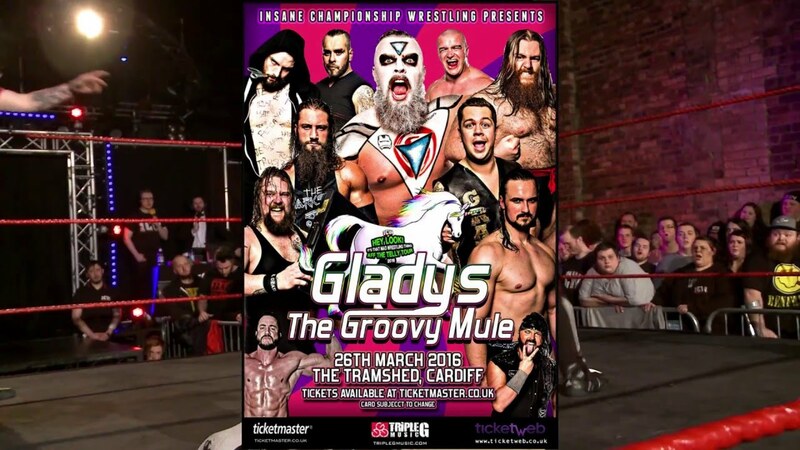 Daft chants aside, Bram ended up getting on the mic to say he pledges himself to The Black Label, so welcome to The Black Label, Bram, much to the disapproval of everyone else, and even more so after Drew made fun of ICW being in Cardiff for the first time. By this time it was intermission and nothing much of note happened, just had more trouble finding space to see the show after getting another Raspberry Kopparberg, oh Raspberry Kopparberg, why can’t you always be in my life? While people were like, whatever, about DCT and Coach, in all honestly, the real treat came when Like a Prayer started playing and the man of the show, Grado, made his way to the ring with everyone singing along to it. Personally, Grado isn’t my type of wrestler, but you can’t deny that his entrance is a thing of beauty. Going into my previous comment, this match was mostly done for comedy, as most Grado matches usually do. It was fine for everyone else though as they seemed to enjoy Grado stealing Coach’s whistle and doing all sorts of bits with it. This was also the most musical the live crowd was for the whole show as they came up with many different sport chants for Grado as well as a few unnecessary chants that I have talked about in the past in my other reviews. ‘Aaaaaaaaaaay! We want some Graaaaaaado!’. They also did this for Damo as a forgotten mention and I don’t like it. They also sang Alabama’s Hey Baby at Grado replacing Baby with Bayley,sorry, I meant Grado. I mean, it would have been cute if they wanted him to be their guy, but yet these people must be gender confused or something as they called him a woman. Well the louder ones were some of the drunker ones so that’s also telling. Grado didn’t seem to mind as he was having just as much fun as everyone, must be big into Alabama. In the end, Grado got the win after his R-Grado/Grado Cutta finisher. After the match, Grado extended his hand out to DCT, who was a fine sport about the loss and accepted it. His coach on the other hand wasn’t too much, but ended up getting a R-Grado Cutta of his own. After this Like a Prayer played once again and he was having fun with everyone by the guardrails and those at the commentary table. Such a wee jolly fellow that Grado is, eh? Again, the match was fine and I don’t dislike Grado, I’m just not the biggest fan of the way he portrays himself and the people that flock to him in the daftest of ways. But as long as everyone is having fun and they are coming to see him and the show(s) he is a part of, who am I to complain. This was the match I was looking most forward to, for obvious reasons, as the country’s own Bird and Boar, who were both making their ICW debut, got a huge ovation from everyone, nearly out beating Grado’s from the last match – nearly. Hey, they may be Welsh and proud of it, but they ain’t no Madonna. The champions, however, didn’t get as much love, and from the start of the match you could see seeds of trouble for both 55 members as Fite underwent chants of ‘Gillberg’ and many crude remarks on being bald with a beard. Sha found these chants funny while Fite – not so much. I mean they had moments of working well as a team once again, since, they are the Tag Team Champions for a reason after all, using many a dirty tactic to the get the upper hand, but both Boar and Mike worked well together throughout as they managed to mix up their hybrid singles styles into a few nice double team moves. Boar was the crowd favourite out of everyone, making use of his mixtures of grappling ability alongside fast paced and heavy impact moves. But it was Mike Bird who seemed to get the pinfall victory after hitting his Gotch-Style Piledriver on Sha. But while everyone was celebrating this new championship victory, it was called to the attention that Sha’s foot was on the bottom rope, which the entire crowd called out, myself included. Well, I mean I saw the foot on the rope happen, so it really wasn’t a lie, but the idea of Bird and Boar winning the Tag titles on their debut match at ICW would have been amazing. Sadly that didn’t happen as the match restarted, and as soon as it did, Kite threw Boar out of the ring and ‘The East End Butcher’, Sha, rolled up Mike for a school boy while having his feet on the bottom rope again. The ref didn’t see and neither did Boar, so we couldn’t have a repeat of what just happened. Needless to say, our boys weren’t too happy and Mike got on to say that everyone knew they had the match won, followed by the idea of both of them going to the champion’s home ground (Scotland) to have another shot at the championships. That would be amazing. And hopefully it will happen sooner rather than later. This match has Lestyn Rees taking on ICW’s Square Go! Holder, Wolfgang, who wasn’t much loved by the people. By this point I was able to sit on the floor between two people to see the rest of the show properly, which was great. Not so great was that before the match even began, I see a large amount of drink fly across from the bar area on the ground floor, hitting a few people, nearly hitting the ring. They get a public warning as security come up to the area it happened in with a large ‘Cheerio!’ song from people which I though was actually funny. After this, Wolfgang used it as a chance to get the first strike on Lestyn, which made me think it was a part of the show, but later on during this match, a few loud, chatty people, who weren’t originally on the balcony, were suddenly talking to themselves, getting closer and closer as the show went on, so maybe there was a domestic with a few people at the show for whatever reason. Anyway, trivial matters aside, everyone didn’t seem as into this match as they seemed to be a little on edge for more drunken shenanigans around them. Wolfgang seemed to dominate most of the match with Lestyn having a few moments, only to get kicked back down in return. The people started getting behind Lestyn towards the end as he was making a comeback, but in the end after a distraction to the ref and a briefcase shot to the head from Wolfgang to Rees, we see the Square Go! Holder winning the match. After the match he attacked Lestyn some more, but ended up getting a Spear for his troubles and simply wandered off with people behind Lestyn. Linking back to the attack before the intermission, we have the challenger, Bram, enter the ring with Drew Galloway and Jack Jester, along with the TNA King of the Mountain Championship. Huh, really didn’t expect that, mainly because while it’s not as important as the TNA World Championship in their title rankings, if you follow what is being shown on television right now, Bram isn’t the King of the Mountain Champion, but did win the championship at recent TNA tapings. Didn’t expect him to have the championship with him so that was a shock. The much beloved ICW World Champion, The Beast Of Belfast, Big Damo entered with The New Age Kliq, BT Gunn and Chris Renfrew, and got on the mic to basically tell Drew and Jack to get lost or they would chase them down. In the end after some long stalling, all those at ringside ended up leaving, so the match would be fair and square, though that didn’t stop the two of them from putting on the craziest match of the night. Everything happened in this match, EVERYTHING! ‘Aaaaaaaaaaay! We want some Daaaaaaamo!’ chants, outside brawling, outside brawling over the barricade and through the crowds into the merch stand and into the bar area, where Damo even sprayed Bram with one of the drink pumps! More brawling back at ringside where Bram threw Damo into a guardrail the first time, bending the guardrail in half! Then a second time, but sending him through the steel guardrail, actually through the smaller bars, which looked immensely painful! In the back of my head I’m thinking, ‘That might be me someday – why?!’. A ‘This is Awesome’ chant which was okay since it only happened once the whole show instead of being overused in most places these days, and the sights at that point were pretty damn unbelievable. Besides these entertaining yet brutal moments, both of these beastly men were just beating each other up something fierce during this match. Out of the two though, I was amazed to see someone as huge as Damo have such agility in his moves. The point is he’s incredibly quick when I really didn’t expect him to be. Bram also used his strengths with his more muscular build while also using the usual bad guy shenanigans to get the advantage. At one point he hit his Lifting DDT finisher on Damo, which he dubs ‘The Brighter Side of Suffering’, but Damo got back up from that as well. There was even point when both had the chance to use either the TNA KOTM Championship or the ICW World Championship as weapons. Bram threw away the ICW title and hit Damo with the TNA title. Damo had the same idea shortly after but threw away the TNA title and used the ICW title instead to hit Bram. After this, Damo hit an incredible move in what I could only describe as some Electric Chair/Samoan Driver combo. Whatever it was, it was incredible and did the job as Damo got the pinfall victory from it and retained his championship. And there you go, my first ever ICW show, definitely unlike any other I have been to thus far, and hopefully I get to go to more in the future. But, yeah, hopefully I didn’t bore you with my use of repeated words and over explanation of certain parts of the show, I do this in all of my reviews and feel bad about it. I just do that to try and convey why these shows stand out and why people who read these need to pay closer attention to what’s around them, whether it be coming over for a visit, like ICW, or local promotions in areas near to you. Support Indy Wrestling and all that sweet goodness. And that’s as good a note as any to end things. Until the next one!